123PassportPhoto is a free passport photo generator that helps you to make Singapore passport photo online. Photo size must be 35 mm wide by 45 mm high without border. Taken with the image of your face measuring between 25 mm and 35 mm from chin to crown of head. You don't need to worry about the size requirements. Our crop tool will help you to get the correct size. Refer to Singapore passport photo requirements for more informaiton. First of all, you need to take a photo using a digital camera. 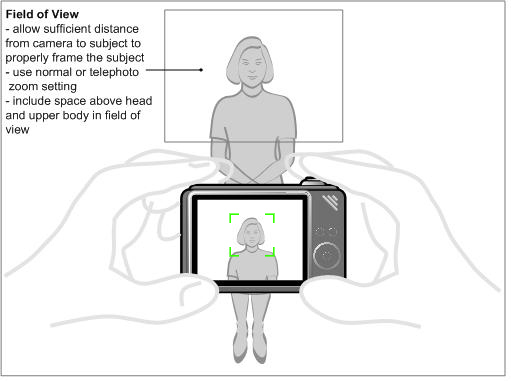 Please follow the passport photo guidelines to take a photo that is suitable to make passport photos. Passport photo must be in color. Photo has white or off-white background. If you take photo against a white wall, there should be no decoration on the wall. Look straight to the camera. Both ears should be visible. The photo must be with neutral facial expression. Both eyes should be open. Mouth must be closed. No smiling. Do not wear a hat. Full face must be visible. There should be no other objects in the photo background or on the face, such as headset. There should be no hair on the face as well. If possible, do not wear glasses, especially glasses with dark frames. If you must wear glasses, ensure that there is no reflection on the glasses. Both eyes must be clearly visible. Forehead and eyebrows should be visible. Do not cover eyebrows with hair. There must be no shadow on the face and behind the head. Please see the tips below on how to avoid shadow in the photo. Lighting on the face must be even. Take photo in bright room. Use a white wall as background. Stand one meter away from the wall, otherwise there may be shadow on the wall. Use a tripod. Adjust the camera position to the eye level. When adjust the camera distance to leave enough space between the top of the head and top border of the photo. Refer to the general guidelines for more details. Select a country. Different countries/regions have different requirements for passport photos. With the country selection, our system will get correct the passport photo size from our database and use the information in the following steps. Upload your photo. The file size should be smaller that 10MB and the photo size should be smaller than 4000 x 3000 pixels. The system processes only .jpg or .jpeg files. It may a few moments to finish the uploading process depending on the file size of the photo and the connection bandwidth. Crop photo. You can use the selection tool to choose the region of the photo according to the passport photo requirement. The ratio of width and height is preset based on the country selection. You can resize and move the region. Download passport photos. With the three steps above, you will get a 4R sheet with multiple passport photos. Follow the instruction on the download page to save the 4R sheet in your computer. Photos must be printed on matte, plain white photo-quality paper. You can choose to print the photos with color printer, or print it online.